Sunday afternoon the boys and I headed to the grocery store to pick out two items from Farm Rich to try. We easily located them in the freezer section, and then had a hard time deciding which two to pick. The boys were definite on mini quesadillas (one of their favorite foods) but had a harder time making a second choice. We finally picked the queso cheese bites. It was nice not having to spend a lot of time on dinner. The quesadillas took 13 minutes to bake. 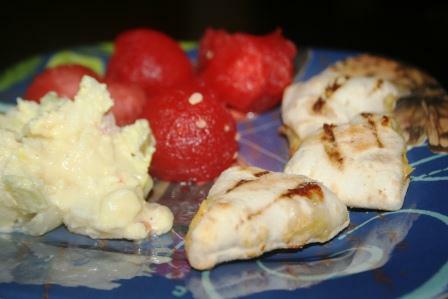 I had leftover potato salad that my dad made, plus a watermelon I had cut up. Easiest dinner ever! I actually felt like I got a night off, and I loved that it left me with more time to spend with my family. It was unanimous that we all loved the quesadillas. The queso cheese bites were a huge hit with Paul and I, but the boys thought they were too spicy. They are in a big anti-spicy phase, much to my dismay. However, that left more for Paul and I, who thought the little kick was awesome and we both found the cheese to have a distinctive and wonderful flavor. If you were hosting a party, these would make the perfect quick and easy appetizer. 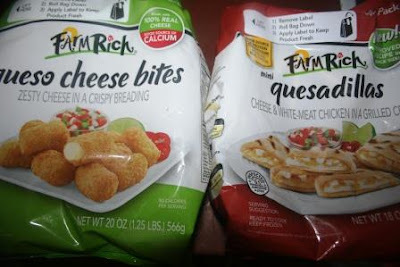 Would you like to enter to win coupons to try two Farm Rich products? Just click on the "Read More" below my signature for a chance to enter! Disclaimer: I received coupons for two Farm Rich products to try for review purposes. The opinions stated above are my own. These look really wonderful. I have a coupon for Farm Rich. I so need to dig it out. Hey we buy those great products! !! Have a great weekend! Hubs would like the breaded Mozzerella sticks. Love the messy boy picture; reminds me of my stepsons! Speaking of boys, I hope the younger ones are enjoying their big boy bunkbed! I'm all for saving time at meal time. Would love to try the quesadillas! I'll have to look for these--my husband loves spicy foods, and they are a quick choice for a meal. 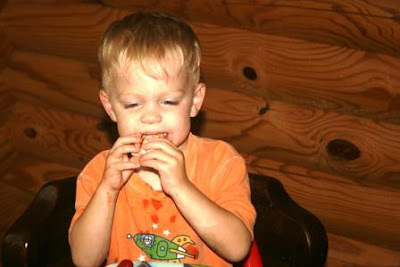 Love the photo of your son enjoying his food! I've been looking for something quick and easy for dinner...I think this is it! Thanks for the share. Wishing you and family a delightful weekend! That's fun for the kids to have cool items....for you, low cooking aspect. Win for all. They look good. I like to keep stuff like that in the freezer for unexpected company. o i don't know Farm Rich. and I pay attention to healthy food? Well I'm entering the contest for dang sure. I love junk jewelry, (-$5.00) but it doesn't look it. your little one looks adorable covered in watermelon!! Yay for a night off of no cooking! The food looks delicious! I don't see "read more" or your signature. I love Farm Rich meatballs. They're awesome! We'd try the meatballs and the mozzarella sticks. Its a hard decision,but I bet the mini burgers are delicious! I have always wanted to try the mozzarella sticks! I'd love to try the mozza sticks!! I'd try the mozzarella sticks. Mozzarella Sticks are definitely my fav.. I don't think anything can beat them! I'd like the mozarella sticks. I would love to try the mozzarella sticks! I would like to try the Cheese Steak. Your boys are really enjoying theirs. I would really like to try the Mozzarella sticks and some of the new varieties. Look like your boys are enjoying theirs. I would love to try the Mozzarella sticks. Fingers crossed. Hope that I win will share with my friend.